The resistor for regeneration electric power absorption of our company regenerate electric power which the train of an electric railroad company generates at the time of a stop. The resistor which absorbs the electric power generated when the large-sized crane currently called the measure against a regeneration lapse and the resistor for back power absorption which absorb the electric power and are made to stop a train when the train to take over is not in the neighborhood hangs and takes down a load, (at quick use time) and can be made to do work safely are delivered to electric railroad companies, overall electrical companies, heavy electric, and heavy industries. 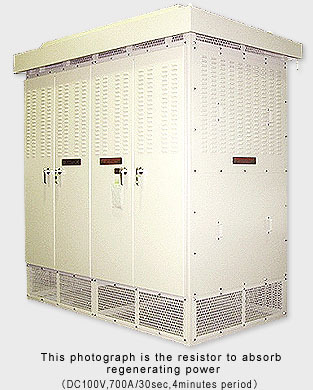 The voltage supplies from DC750V to AC22KV for the resistor specification, and an electric current delivers many resistors for regeneration electric power absorption up to about 1000 A. Radiation is using metallic resistance element with the good structure. The natural cooling is being adopted as much as possible. It is manufactured as safe even if loaded by the machine room of large-sized crane, and pay attention to the vibration and wind pressure etc…. For an installation site to continue variably, it considers also corruption measure. Other resistors for industry are as below.